This is intended as an introductory post to explain the Keynesian (and Kaleckian) view of causation between desired investment and desired saving in particular, and desired injections and desired leakages in general. Initially, the argument is presented with reference to a simple two-sector income-expenditure model of a pure private economy. The model illustrates the Keynesian view that provided the economy is operating below full employment and there is idle capacity, desired investment generates desired saving via income adjustments rather than being financed by that saving. The second part of the post employs a four-sector model with government and external sectors included to draw out a couple of points emphasized by modern monetary theorists. In a pure private economy, the two sectors could either be workers and capitalists or households and firms. Kalecki chose the former, Keynes the latter. It doesn’t matter which is chosen for present purposes because both Kalecki and Keynes came to the same conclusions regarding causation. Here, the Keynesian version is presented. The Keynesian models to be considered are short run in nature in that the productive capacity of the economy is taken as given. That means the effect of investment on productive capacity is abstracted from and only its impact on current demand and income is taken into account. This assumption is not as strange as it may seem, since the impact of investment on capacity lags behind its effect on current demand and income. All variables are in real (i.e. price-deflated) terms. The first identity says that income, Y, always equals total expenditure, E. Total expenditure is comprised of two types of spending: consumption, C, and investment, I. Investment is capacity-expanding expenditure such as fixed investment in plant and machinery as well as unsold inventories, since these also add to the capacity of the economy to meet demand. The second identity refers to the uses of income. It can be consumed or saved, S. The third identity indicates that saving always equals investment. It follows directly from the first two identities. Identities do not imply equilibrium. The first and third identities hold because of the way investment is defined. Although unsold inventories are capacity-expanding and so counted as investment, the amount of inventories held by firms may be intentional or a mistake. Macroeconomic equilibrium requires desires (or plans) to be realized. If desires are not realized, there will be an impetus for change as firms and households attempt to bring actual outcomes into conformity with their desires. The ‘e’ subscript indicates an equilibrium level. The ‘d’ subscripts indicate desired magnitudes. It is only when income or output match desired total expenditure that the economy is in equilibrium. The second equilibrium condition follows directly from the first by simple rearrangement, noting that Y – Cd = Sd. Undesired investment, Iu, refers to unexpected changes in inventories. Undesired saving, Su, can occur when goods or services are temporarily unavailable, due to shortages or interruptions in production. Whenever desires go unrealized, there is disequilibrium. To say anything about the way the economy might move from disequilibrium to equilibrium, it is necessary to make an argument concerning causation. And this requires making behavioral assumptions. Unlike identities, behavioral assumptions are contestable. A key assumption of the model is that firms will respond to unanticipated changes in inventories by adjusting the level of production. Many firms intentionally plan for a certain amount of inventories. These are part of desired investment and will not induce a change in behavior. But when firms sell less than anticipated, they are assumed to cut back production in an attempt to eliminate the undesired investment. In the reverse case of excess demand, inventories will be unexpectedly depleted and firms will attempt to bring negative undesired investment back up to zero by expanding production. Desired consumption and desired saving are assumed endogenous and positively related to income, although some consumption and saving occurs independently of income. Desired investment is assumed exogenous. It is financed independently of current income out of past savings or borrowing. The first equation is the equilibrium condition. The second and third are behavioral equations. The ‘o’ subscripts indicate exogenous variables. In the second equation, the consumption function includes an autonomous component, Co, and an induced component, cY, where c is the marginal propensity to consume or mpc (0 < c < 1). The mpc is the fraction of an additional increment of income that is consumed. It is assumed to be stable, at least over a realistic range of income. Here, s (= 1 – c) is the marginal propensity to save or mps. The third equation says that desired investment is exogenous or autonomous of income. This leaves the determination of investment open, making the model compatible with a variety of competing theories of investment. This says that equilibrium income is a multiple of exogenous expenditure. The multiplier, k, is 1/(1 – c). As required, desired saving equals desired investment, and equivalently, the sum of desired consumption and desired investment equals income. The model can be used to see how changes in the exogenous variables (autonomous consumption and desired investment) or structural parameter (the mpc) affect the endogenous variables (income, desired consumption and desired saving). Exogenous expenditure is received as income by firms and this sets in place a multiplier process as the income induces additional consumption that creates additional income. However, in each round of the process, some income leaks out to saving, so the impact of the initial exogenous expenditure becomes smaller each round until negligible. The leakages on each round of the process ensure that income (output, supply) eventually catches up to desired total expenditure (demand). Example 1a. Desired investment is ‘self-financing’. Let the economy initially be in the equilibrium described above: Y = 500, Sd = Id = 100 and Cd = 400. Now imagine that desired investment increases from 100 to 120. 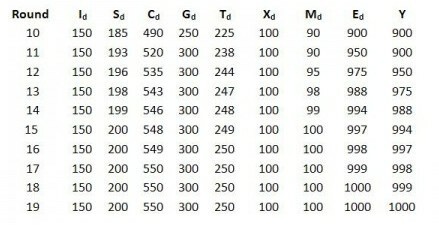 The effect of this is outlined in the table below. All entries are rounded, if necessary, to whole numbers. Round 0 shows the initial equilibrium. In round 1, the intention to increase desired investment by 20 causes excess demand as desired total expenditure outstrips income. Disequilibrium is also indicated by the undesired saving of 20. In round 2, the injection of extra spending is received as income by firms producing investment goods and this higher income induces a response from households, who consume 80 percent of the additional income and save 20 percent, in accordance with the marginal propensities to consume and save. As a result, desired total expenditure remains above income, but by less than previously due to the leakage to saving. Notice that the increase in desired saving eliminates some of the undesired saving. The process continues in successive rounds until equilibrium is restored. The example shows income and output adjusting to demand. Notice how income lags demand. The example also illustrates the Keynesian view of how an initial increase in desired investment that is unaccompanied by an equal intention to save nevertheless sets in motion a process by which income adjustments induce the necessary desired saving. This enables the economy to stabilize at a new, higher level of equilibrium income. Example 1b. Paradox of Thrift. Once again, round 0 shows the initial equilibrium. In round 1, desired saving increases by 20. There is a reduction of the same amount in desired consumption due to a fall in autonomous consumption. The higher desired saving causes excess supply and undesired investment of 20. In round 2, firms respond by cutting back production. It is assumed that in each round of the multiplier process, firms cut back by the amount of the previous round’s undesired investment. They continue to do this until undesired investment stabilizes at zero. The example illustrates the Keynesian view of how an attempt to increase desired saving is self-defeating and cannot finance desired investment. Negative income adjustments wipe out any desired saving that is in excess of the level of desired investment. Imports are subtracted from the first identity and left out of the second to avoid double counting. In the national accounts, import spending is already included in domestic categories of expenditure. The first of these shows that injections equal leakages, by definition. The second is the familiar sectoral balances identity. The financial balances of the domestic private sector, government and foreigners must cancel each other out. The first version of the equilibrium condition says that desired total expenditure must equal income. The second version says that desired injections must equal desired leakages. The third version says that the government’s fiscal position (T – G)* must be consistent with the desired net financial accumulation of both the domestic private sector and foreigners. The * indicates consistency with equilibrium. (See pp.17, 42 of a recent paper by Tymoigne and Wray). In the four-sector model, government spending and exports are assumed exogenous in addition to desired investment. Taxation and imports are assumed endogenous and, like desired consumption and desired saving, positively related to income. Notice that the tax and import functions have both autonomous and induced components, similar to the consumption function. Much tax revenue is induced, but some taxes and fees are imposed independently of income. Similarly, import spending is largely connected to income but is also influenced by other factors such as the exchange rate. The parameters t and m are the marginal propensities to tax and import, respectively. The numerator is net autonomous expenditure. The denominator is the reciprocal of the multiplier. The multiplier is smaller than in the two-sector model because of the additional leakages that occur due to taxes and imports during the multiplier process. Example 2a. Exogenous increase in desired investment. 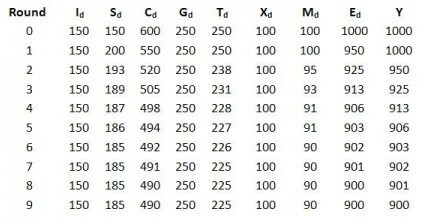 In calculating the following table, it was assumed that c = 0.8, s = 0.2, t = 0.25, m = 0.1. The multiplier is 2. To save space, Co, To and Mo were all set to zero. In round 0, the economy is in equilibrium, so Ed = Y and Id + Gd + Xd = Sd + Td + Md. Although not necessary for equilibrium, the example starts with all sectoral budgets balanced. This was done to make the impact of the multiplier process on the three sectoral balances obvious. In round 1, desired investment increases by 50. This causes excess demand (Ed > Y) and sets off the multiplier process. In round 2, firms expand production to meet the higher demand. The resulting addition to income induces extra desired consumption but also leakages to saving, tax revenue and import spending. Each round, the addition to total expenditure gets smaller and income gradually adjusts to demand. The causation is the same as in the two-sector model, but the effect of an exogenous change in demand (in this case desired investment) is felt by all leakages. The extra 50 in investment causes a multiplied change in income that eventually increases the sum of leakages by the same amount of 50. In the initial equilibrium, desired injections and leakages both summed to 500. In the new equilibrium at the higher income of 1100, desired injections and leakages both sum to 550. Notice that the sectoral balances, which were all zero in the initial equilibrium, have diverged. The multiplied increase in income has boosted tax revenues and to a lesser extent imports. As a consequence, the government and foreigners are now in surplus by a combined amount of 35. This is offset by the domestic private sector, which is in deficit, spending more than its income. Example 2b. Exogenous increase in desired saving. Whereas in the simple two-sector model a spontaneous attempt to increase desired saving is entirely self-defeating, this is not the case in the four-sector model. The negative income adjustments will now hit not only private saving but tax revenue and imports. Accordingly, the private sector can achieve higher saving to the extent that there are leakages to taxes and imports. The economic effect will still be negative if the attempt to increase saving is in isolation. There will be lower income and the government will be running a “bad deficit” in that it is caused by an endogenous reduction in tax revenue driven by falling income. If instead the government steps up its net spending to counteract the negative impact on income, the domestic private sector can have higher desired saving alongside strong income. 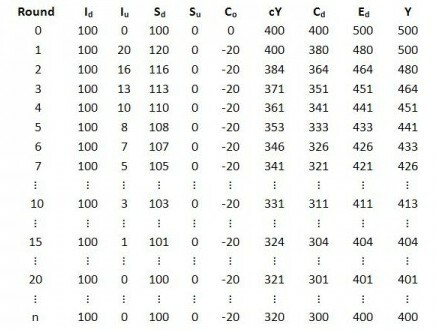 Referring to the table below, round 0 describes the same initial equilibrium that was in the preceding example. In round 1, the domestic private sector exogenously steps up its saving by 50. This means autonomous consumption is -50, though it is not shown in the table. For a while, the government stands by as income falls. Desired saving drops back a bit but still remains significantly above its initial level as the government’s deficit increases endogenously. Foreigners also move into deficit. By round 9, a new equilibrium is just about reached but it is pretty awful, income having plummeted 10 percent. The domestic private sector has managed a surplus of 35, which is offset by a government deficit of 25 and external surplus of 10. The government belatedly decides to step up its spending by 50. This sets off rounds 10-19. The table shows that the government has managed to offset the negative effects on income of the reduced private spending and increased saving by lifting its own expenditure. This has enabled the domestic private sector to attain its desired surplus of 50 without any decline in income. That is not to say that the government should always simply enable the desired surplus of the domestic private sector. Private spending and saving behavior are influenced by distribution, institutional arrangements and other factors that might all need addressing. There are various strategies that could be employed in addition to an increase in government net expenditure. The job-guarantee program could ensure full employment irrespective of the desired net financial accumulation of the domestic private sector and foreigners. A redistribution of income to middle and low-income recipients would boost spending for any given desired sectoral outcome. A debt jubilee would free up private income for spending that is currently devoted to private debt service. And so on. This should make a good addition to this post: http://modernmoney.wordpress.com/2013/07/09/modern-money-mechanics-goes-troppo-2/ don’t you think? Senexx: The post is designed as background for ‘Sectoral Balances and Keynesian Causation’, which is intended as background for the sectoral financial balances model. Ambiguous answer. You do not consider this a mathematical model of the sectoral balances? I’m not sure what you’re getting at. It’s the standard Keynesian income-expenditure model, but yes, it includes the sectoral balances, and you can consider what might happen to the balances due to various exogenous events. The sectoral financial balances model follows from it. For example, the causation is the same. That’s the point of this post, to spell out the causation, which underpins all Keynes and Kalecki influenced macro, including MMT. Great stuff Peter. I think I managed to follow it all. This question might disprove that however. I’ve been trying to work through Godley & Lavoie’s Monetary Economics but keep getting stuck when it comes to Steady & Stationary State solutions. I assume these correspond in some way to your ‘Equilibrium’ as described above but I would be interested in your (or Trixies) understanding of the difference between the two. That’s an astute question, Andy. If you consult sections 3.4 and 3.5 (pp.68-74) of Monetary Economics, it’s right on the topic of your question. The examples in this post were of short run equilibrium. Once period n is reached and convergence to equilibrium completed, there is nothing to change any of the flows (expenditures, saving, income, etc.). If the example continued, they would remain constant and in a constant relationship with each other until we changed another exogenous variable or parameter. But the flows would still be causing changes in stocks. And because the flows would be in constant relationship to each other, the stocks would diverge forever. This is unrealistic. For example, if the private sector is in surplus for a long time, accumulating financial assets, at some point it will increase autonomous consumption. And when it does, the additional consumption demand will boost income, tax revenue and imports, altering the sectoral balances. In a long run setting, the stronger consumption demand will (from a Keynesian perspective) also induce additional planned investment, whereas of course in the short-run models explained in the post, investment is never induced because it is assumed exogenous. The significance of norms, if identified, is that they suggest how the sectors are likely to respond over time to the evolution of stocks and flows. In an informal and limited way, you can take some of this into account with the short-run model, by judiciously choosing a series of rough-and-ready exogenous changes informed by what is happening to the stocks. For example, I discussed some implications in terms of the sectoral balances. Godley and Lavoie’s models share the same Keynesian causation but are obviously more sophisticated and systematic in their integration of assumed norm-based behavior. Bear in mind that the models inevitably are more mechanical than reality, as Godley and Lavoie stress in chapter 1. In reality, there are no steady states or even equilibrium, but norms and institutions do guide the behavior that occurs in disequilibrium. Thank you. That definitely moves me on. I had noted the warnings in G&L about their use and remember Scott using them in one particular article to make a point. I don’t think I quite appreciated how model-specific they were and that, if you draw any assumptions, those have to be as specific and subject to the behavioural assumptions of that model. I will have to find and reread Scott’s article. That’s why conventional macro models are used erroneously when used for policy formulation or to otherwise make statements or predictions about the real world. The assumptions don’t fit, so the conclusions that follow from the model don’t necessarily apply to the facts. If they bothered to test they would know this but that would spoil the game. It’s magical thinking that reveals conventional economists either as charlatans attempting to dupe the rubes with ideology, or else proof they are rubes themselves — or maybe a combo of both. This is so basic it should be obvious to anyone, as Lars Syll continually points out at his place. So for instance in your example 2b, where you examine a change in ‘planned savings’ of the non-govt, I guess of that sector’s own volition, what would happen if you ran that scenario where the first thing that would happen would be that due to an ‘unplanned’ govt initiative (war, famine, etc…) the govt would first thing forcibly require the non-govt to save even more than that sector had already planned? Hi Matt. Interesting question. If the domestic private sector is forced to save more than it otherwise would have (such as in WW2), this will be an increase in actual saving above planned saving, as you correctly point out. That is, unplanned saving will be positive. If the government does not offset the reduction in private spending with public spending, negative income adjustments would reduce unplanned saving. But if the government more than offsets the loss of private spending (as in WW2), income adjustments will cause actual saving to increase further. Some of this will be planned (since higher income induces more planned saving) but much of it will be unplanned. When the situation ends, there will be plenty of pent up private demand (unplanned saving intended to be spent) ready to drive activity. Can you run your model here then from a ‘supply side’ scenario where the govt solely cuts the taxes and then expects this to “help” in some way? I am not sure I understand Wray’s equation there, but I assume he is asserting that at a time t=0 there is an ‘equilibrium’ state. Then along comes something to disturb the ‘equilibrium’? This is the basic assumption? ok, if this ‘outside event” is solely a ‘tax cut’, then what happens? It would seem that the first effect would be a decrease in T. Which would increase the public deficit and as bond sales have to precede, this decrease in T would FIRST act to increase S (ie ‘savings’) and then that is a leakage. If the only thing that is acted upon is T, can things be shown to improve in the other terms? ie terms other than S? So, there are two avenues of effect for a tax cut: the second and third terms in the rearranged consumption function. From the second term, a cut in exogenous taxes (To) will cause additional consumption cTo (since the change in To is negative). Note that the initial impact on demand of a cut in To is less than itself (since c < 1), whereas the initial impact on demand of an increase in government spending is itself. Referring to the third term, a cut in the marginal propensity to tax (t) will mean higher induced consumption. This is partly because c is a fraction of disposable income, and disposable income will be higher now that taxes are lower. It is also because the expenditure multiplier is now larger due to less leakage. So whatever autonomous expenditure happens to be, it will now translate into a higher income than before the tax cut and, for a given c, higher consumption. The issuance of government bonds to match the deficit in itself doesn't affect the level of saving when the saving is not forced (i.e. provided it is the non-government voluntarily purchasing the bonds rather than saving in some other form). It will only effect the composition of saving. You would expect both consumption and saving to increase in the initial response to a tax cut. That's a difference between a tax cut and an increase in government spending. The effect of an increase in government spending goes entirely to demand in the first round of the multiplier process, and leakages commence the next round. A tax cut goes partly to leakages in the first round as well as later rounds. For this reason, the stimulatory effect of an increase in government spending is somewhat greater than a tax cut, but they are both stimulatory. This relates to the so-called 'balanced budget theorem'. In a simplified 3-sector closed economy model with only exogenous taxes, the expenditure multiplier is 1/(1 - c) and the tax multiplier is c/(1 - c). The difference in the numerators of the two multipliers is due to the initial impact of an increase in government spending and an increase in exogenous taxes. If government spending is increased by X and exogenous taxes are reduced by the same amount, the combined effect once the multiplier process has played itself out would be an increase in income of X. In other words, the 'balanced budget multiplier' is 1 in such a model. This can be seen by noting that the impact of the change in government spending is X/(1 - c) and the impact of the equal-sized tax cut is -cX/(1 - c). Adding them together gives (1 - c)X/(1 - c) = X. In more elaborate models with an external sector and endogenous taxes, the balanced-budget multiplier is no longer 1, but the somewhat greater stimulatory effect of government spending remains, because of what happens on the first round. It should be noted though that the models considered here all assume the same expenditure multiplier for different types of spending, and the same tax multiplier for different types of tax cuts. More sophisticated models would attempt to distinguish these. For example, a cash transfer to low and middle income recipients (which counts as a negative tax and functions as a tax cut) would have a higher multiplier effect than some types of government spending. On the other hand, tax cuts to the 1 percent would have very little, if any, stimulatory effect. What about how non-govt agents have to change the (at least) non-trivial ‘composition’ of their previous savings here? I may not be following your point, Matt. But if the savers were planning to spend some of the saving over the next few months, why would they agree voluntarily to shift that much into longer bonds? I can see if there is compulsion that the effect could occur, as mentioned previously. Quick question: On a scale of 1-10, how much of a Marxist was Kalecki? It depends how central you see Marx’s theory of value to Marxism. He is similar to Baran and Sweezy and the Monthly Review school (who he influenced) in that he eschewed value theory and emphasized demand deficiency. He drew most from volume 2 of Capital and Rosa Luxemburg. Some would categorize him as a left Keynesian and so not Marxist at all. So maybe Kalecki gets a 0. Or maybe a 5-7. It doesn’t matter because he was a 10/10 Kaleckian. It doesn’t matter because he was a 10/10 Kaleckian. 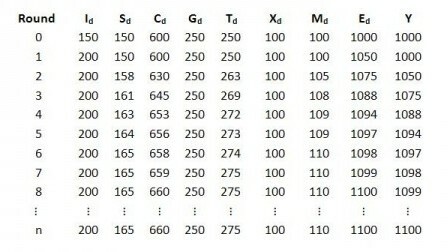 Considering the table in “Example 1a. Desired investment is ‘self-financing'”: Is it correct to conclude that the link between successive rounds is that Y in, say, round 2 (520) is equal to E[d] in the previous round (round 1: 520)? In terms of spreadsheet formulae, if E[d] for round 1 is written on cell J4, then Y for round 2 (cell K5) contains the formula “=J4”. I ask this because, once that link is provided, the rest of the round can be calculated without referencing previous rounds. In terms of formulae: with the exception of Y, all other formulae in row 5 refer to cells also in row 5. 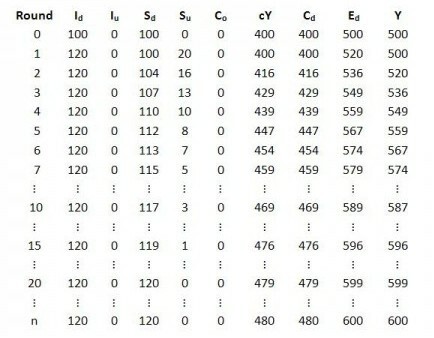 Similarly for the other rows in the table. The idea is that output (income, supply) adjusts to planned expenditure (demand). In the examples, I adopted the simplest adjustment process in which it is assumed, as you correctly surmised, that firms each period try to catch up to demand by producing what was demanded the previous period. In reality, of course, firms might be able to adjust more quickly than this, depending on how easy it is to adjust production levels and how good they are at guessing the likely level of demand. When demand is growing, the firms might adjust production beyond the previous period’s level of demand in anticipation of still further demand. This could cause “overshooting” but also could speed the adjustment process. Thanks, Pete! It seems we were thinking along similar lines. I was wondering something. New Keynesian macro books (like the Dornbusch and Fischer one) always make reference to a comparison output vs trend output as criterion to decide on which phase of the business cycle the economy was. I’ve never seen PoKe economists speak of this trend. Do PoKe economists use a different criterion? If the trend rate is taken to refer to the growth rate consistent with full employment and potential output, and regarded as the “long run rate of growth”, the conception is not really consistent with PKE, because there is no reason to expect growth to tend to such a rate of growth. Inside capacity constraints, growth is demand led in PKE. Potential output sets the upper limit on a long run rate of growth, but there is no reason in PKE to expect the economy to tend to this rate. If, in contrast, trend is just interpreted as an average of past rates with no implication of full employment or any tendency for the trend rate to be maintained in the future, it might be used by a PK economist to observe cyclical fluctuations. Kalecki, for example, saw the trend as just an average of past rates with no existence independent of the actual path taken by the economy. At any rate, it certainly is not simply an statistically calculated trend. By coincidence, Chris Dillow just posted on this subject of the Dornbusch/Fischer output vs trend output comparison (more precisely, its effect on the government budget). It seems since the D/F book was published (it’s an old book), the comparison they speak of has become known as “output gap”. Anyway, Dillow is lambasting it; “mumbo-jumbo” he calls it, and attributes its expression in terms of fiscal revenue to an statistical artefact, due to lags between the business cycle and the moment the Exchequer (he is treating the UK case) actually registers changes in fiscal revenue. In the fiscal context, Dillow’s discussion also reminds me of the automatic stabilizers (although he doesn’t mention that).